This is the second part of my report on UKIP's public meeting about the European elections, at the Town Hall on 8th May. The first part covered the party's scientifically-challenged energy policy. "Are you standing to be MEPs, hoping to lose your jobs?" 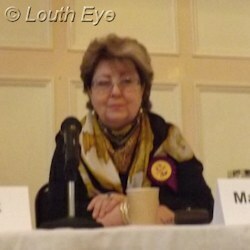 Councillor Laura Stephenson asked the panel of UKIP MEP candidates. "We would like nothing better than to restore democracy to our country," Margot Parker said. "We need to be out of the EU and firmly in Westminster." Someone in the audience asked a question about the repatriation of foreign criminals. "The Human Rights Act is exactly the reason we can't do this," Roger Helmer said. He went on to state: "It is not my responsibility for what goes on in Somalia." UKIP policy is to leave the jurisdiction of the EU and the European Court of Human Rights, according to its manifesto for the 2014 European elections. The next question was rather special. A member of the audience asked: "When is someone from this country going to stand up and say 'get knotted'?" Margot Parker responded by referring to the EU as a "socialist superstate". I love the intellectual rigour of this debate. Although she recognised that UKIP's goal was to be removed from the EU, Councillor Stephenson asked: "What are you doing to get some of that EU money back in our area?" Nigel Wickens fielded this question, conceding that "some good legislation" was made in Brussels, but also s saying: "Anything good doesn't have to be made in Brussels." He noted that UKIP MEPs are often criticised for taking a salary, but he didn't see it that way. "I see it as repatriation of misappropriated funds," he joked. That's all well and good if you're an MEP, but it's a drop in the ocean, and it's not likely to help improve Lincolnshire's infrastructure, or reduce levels of rural poverty in this area. 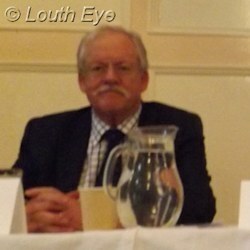 William Grover raised the issue of UKIP's campaigning on immigration in council elections. "I believe as a councillor there is no way you can deal with immigration," he said. Jonathan Bullock responded by saying: "I know the pressure of immigration. We wanted services free from that issue.... Some things do come under it." He went on to quote a figure of 70% of the country "concerned and opposed to uncontrolled immigration", which comes from a recent poll by YouGov. Following this point, a man got up and started shouting. I have no idea what he was saying, which meant he was making more than average sense for the meeting. One member of the audience asked about UKIP's policy on establishing that English is the UK's language. Barry Mahoney spoke about children who come from homes where English is not the first language. "Everybody must learn English," he said. The panel's chair, outgoing MEP Derek Clark, echoed this in his closing remarks when he said: "In Germany all children must be speaking German before they go to school. What's good enough for Germany is good enough for us." The issue of a Scottish referendum for independence, one audience member asked: "Isn't it better for UKIP if Scotland leave the UK?" "We believe in the United Kingdom," Roger Helmer said, reasoning that "there is sufficient similarity" between the English and Scottish. "We are not just an English party." It's curious that an independence party should be so attached to maintaining one union, and not another. I asked whether a central European union is better placed to regulate the banks than each country working on its own? "We're not very happy about the overkill of the EU," Margot Parker replied. "We don't really want the banking clause that the EU want to bring in. You need to leave the City alone." She did concede that bankers' "bonuses continue to rise," which she described as "immoral". "The banking system must be left to do its work," Derek Clark said. That doesn't sound to me like the response of a party willing to hold the financial sector to account and protect the incomes of ordinary people from the worst excesses of bankers. A number of hustings events have given candidates in local and parliamentary election a chance to present themselves and their views to voters. 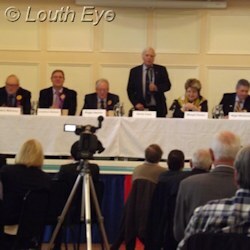 UKIP MEP hopefuls came to Louth to explain their policies at a public meeting. The Lincolnshire County Council meet for the first time since the May elections, and UKIP refuse to sign up to a declaration of equality. The political map of Lincolnshire is no longer true blue.